“We are exquisitely unprepared for that [oldest] age demographic pushing through,” said Dr. Bruce Chernof, president of the SCAN Foundation, an aging advocacy group. 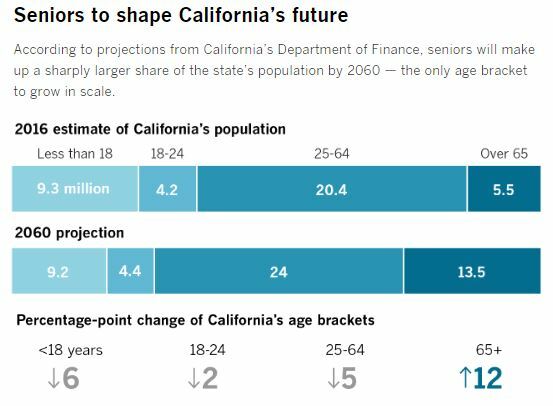 By many measures, California is not ready to meet the demand for long-term care. Just under 2% of residents are insured for it, according to the state Department of Insurance. A 2014 poll found that just 3 in 10 Californians over age 40 felt very confident about their ability to pay for future care. And the Employment Development Department projects that the state will need 250,000 more personal care aides by 2026, a growth rate of 40%. Nancy McPherson, the California state director for AARP, said long-term care is the No. 1 issue for the retiree advocacy group. Though wealthy Californians can rely on long-term care insurance or ample savings and the poorest can qualify for safety-net programs, the middle class is especially vulnerable when it comes to paying for care. The out-of-pocket costs can be staggering, and Medicare, the federal healthcare program for seniors, does not cover long-term care. A 2017 survey by Genworth, a long-term insurance company, found the average yearly cost for a home healthcare aide was $57,200. The median cost for a private room in a nursing home was more than $116,000.